Our current Congresscritter, Rep. Mike Fitzpatrick, jumped on board with the “must look squishy” stance after Newtown and decided to sponsor gun control in the House even when it became clear there would be no vote. It’s not a shock at all. No one actually believes he has a spine on any issue, but that’s part of why some people vote for him. Even our biggest frustration with him isn’t so much that he puts his finger in the air to try and guess the wind direction before taking a position, but that he’s actually not very good at it from a political strategy standpoint. (Of course, he might argue that he wins elections, and that’s a valid argument.) However, in all of that, he didn’t get on board with a gun ban, even though local folks thought he would in the wake of anything controversial. So, that’s at least something positive in the less-than-ideal political reality. Rep. Fitzpatrick also pledged to term limit himself. He’s not running in 2016, which means it’s an open seat that only very slightly leans Republican in voting habits. It’s up for grabs for either party. The first to start the process of running? 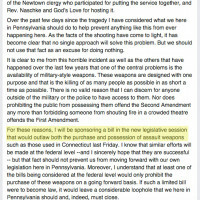 A local lawmaker who pushed banning possession of semi-automatic firearms – confiscation. In his statement, State Rep. Steven Santarsiero complained the gun ban legislation proposed by Sen. Dianne Feinstein to be too moderate and pro-gun for his liking. Lovely. This speculative field of alternative candidates who have grades doesn’t look good for gun rights, either. (Though some on that list haven’t run in an office to have an official grade or put out an official statement on the issue. And one, Jim Cawley, just announced a cushy non-profit CEO job today, so it’s safe to say he’s not interested.) Given the passion with which we oppose the policies of the officially declared candidate, this is a race we will be watching closely. Sebastian and I have already spent dinner conversations on the subject, and we’d like to see one of the state senators from the area run. For Pennsylvanians who follow politics, we’re thinking Sens. Tommy Tomlinson or Chuck McIlhinney. One advantage to McIlhinney, beyond his previous A rating, is that it would help clear the path to liquor store privatization once Gov. Wolf is out of office. On the other hand, Tomlinson probably has the better demographic appeal. His name recognition is also spread across the most populous parts of the Congressional district. Tomlinson was last rated A-, and he did take a walk from us once on the issue of reciprocity a few years ago. As a consequence, he lost his endorsement and came back around on the major recent votes to earn back an endorsement. Tomlinson also won in 2014 after a big “war on women” attack in a Democratic area, so that’s a plus. Does anyone else have any known open seat issues where there’s a not unreasonable chance that the seat will flip from (reasonably) pro-gun to an extreme anti-gun fringe candidate? Are you already looking around the political field for candidates to help early in the race? Drat, he has a middle name. No Godwin joke today. McIlhinney is a spineless RIno of the worst sort. He is the reason we don’t have liquor privatization now. Look into is boot licking with Pat Deion. I hate McIllhinney’s positions on that issue, too. Since I brought it up in the post, it’s clear that it’s an issue I watched in Harrisburg. However, I also recognize that if he was in DC, he wouldn’t be in Harrisburg f*cking up the next privatization effort. Again, this was an analysis on the issue of gun rights. You don’t get everything you want in a politician unless you run for office yourself and only vote for yourself. Otherwise, it’s about picking your battles. 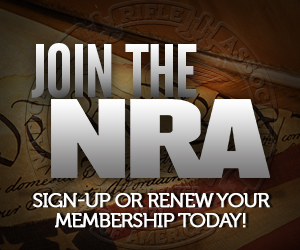 I don’t see Tim Murphy going anywhere thankfully, and Bill Kortz is a solid pro-gun Dem in the state house for us. 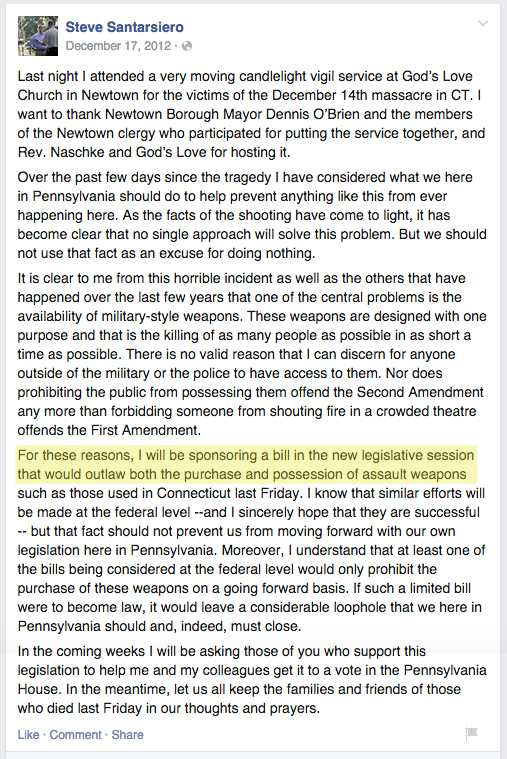 My interest in 2016 (at least in PA) will be on the senate side where Matt Smith, previously B rated and relatively pro-gun has been casting some anti votes as of late. He represents all of extreme southern and western edges of Allegheny county, not the most friendly territories for an anti-gun politician, so I think a good challenger who can hit him hard on his recent record stands a chance.